For a man with an insatiable hunger for runs, Virat Kohli says he derives utmost job satisfaction when he shines in Test cricket, a format he has mastered "watching" teammate Cheteshwar Pujara bat for long hours. 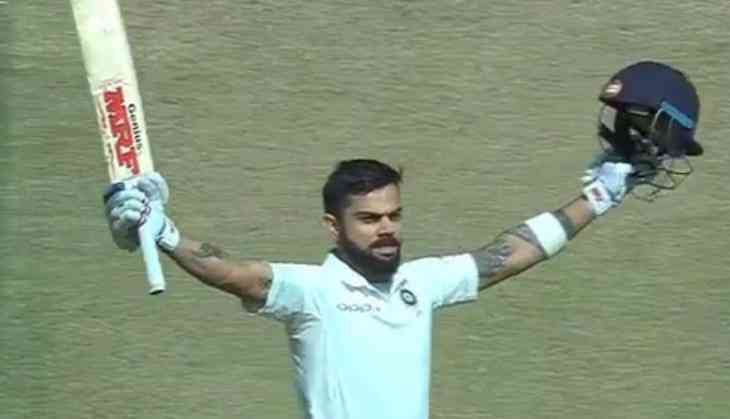 Only 29, Kohli has already established himself as one of the game's greats, yesterday overtaking Brian Lara as the skipper with most Test double hundreds (6). "My favourite obviously is Test cricket, we are making sure from every angle that this should be the most important format because as batsman or as bowlers also we know how pleasing it is to score in Test matches, especially when conditions are tough," Kohli said. The captain was speaking to Pujara on 'bcci.tv'. He added, "You have to counter conditions in South Africa, England, Australia. Job satisfaction is the most in this format. ODI and T20 also from an emotional point of view. When there is a full stadium and you win a close game that gives you a high." Kohli said that it is his teammate Pujara who has inspired him to score big hundreds and that he has learnt to bat longer watching him do that. "It feels wonderful. It was always my mindset to score big hundreds, something that I have watched you do a lot in your career early on and learnt also, how to concentrate for longer periods. "We have all learnt from his (Pujara) long innings, his concentration levels and his will to keep batting. So I also got inspired by that to keep batting for the team for as long as possible. "Now I only think of how I can play more for the team and then you know, you don't feel the tiredness and anything else and keep carrying on looking at the situation," Kohli said. The Indian captain has scored all his six double hundreds in the last 17 months and has also scored 52 international centuries across formats. Kohli said he strives to remain in peak physical fitness in order to make the most of it in the time he has. "We know as professional cricketers, we don't have many years. So, we have to make the most of it and I try to stay as fit as possible, take care of my diet, take care of my training and it's paid off well till now. "In the later half of my career, as we all know it's going to get more difficult. So, I'm trying to put in as much as possible in training now and later on, I can still manage to keep the same kind of intensity. "But I think we all are training so hard now and it's showing on the field and I am just trying to do the same." While it is well documented by now, Kohli was again asked how and when his transformation kicked in, and he was forthright in his reply. "The change started in the 2012 IPL when I had a very bad season and I was expecting a lot from that season because I had scored a Test hundred in Australia and I scored 180 against Pakistan in Asia Cup. "I could not come out of that, my mental state was very bad, I was eating very bad, my habits were not good at all. So I went home afterwards and I saw myself in the mirror after coming out of the shower and I though I can't look like this if I want to be an international cricketer. "So, from the next day onwards, I changed everything about my diet, training and everything. I was in the gym everyday for an hour and half to two hours and I just completely changed my diet." Asked if he is on the lookout to score a double ton in ODIs, Kohli said, "Double hundred is not something I can plan. I think maybe if I get to bat early, if the wicket is nice. "I have come close twice but it's something I can't pinpoint. Rohit has done it twice but I don't think I can play as many shots like him in the latter half of the innings. "He ended up getting there because he is unstoppable when he goes past 130-140. But I will try to do it if I have enough overs.